The BIG day is finally here! Today I’m revealing the Paper Flower Centerpiece I created for my friends “Big Day” using products from the David Tutera Bridal collection. This collection makes it easy for the DIY bride to create a dream wedding on a budget. The products are elegant yet easy to use and customize to your specific needs. You don’t have to be crafty to make the David Tutera Bridal Collection work for you. Take a walk down the aisle with me and I’ll show you how! If you’ve followed along with my Sizzix Paper Flower Tutorials this past week you already know I’ve been “up to something”. I’m just giddy with excitement over the final Paper Flower Centerpiece reveal. I can’t wait to show you all the elements from the David Tutera Bridal Collection that helped make this centerpiece a real dazzler! What I’m about to show you is just a taste of what’s available from David’s collection. This large Brooch is one of my favorites. It just goes to show that you don’t need pricey vintage pieces to add vintage elegance to your wedding. If you missed the earlier paper flower tutorials check out my Watercolor Rose Tutorial and my Paper Hydrangea Tutorial for step by step instructions on how I created the flowers for this wedding day centerpiece. Not the flower making type? No Problem! You can easily use Silk or fresh flowers to create a similar centerpiece for your big day! STEP 2: Cover the front of the foam ring with lace (I used vintage lace from my collection) and secure with dress pins. STEP 3: Stretch wrap flowers to Floral pins with Floral tape and arrange accordingly on the top of foam ring. STEP 4: Fill in any gaps or exposed stems along the bottom of the arrangement with feathers. Secure feathers with floral pins. *I also added the large Brooch from the David Tutera Bridal collection to the front to cover the pins holding the lace. 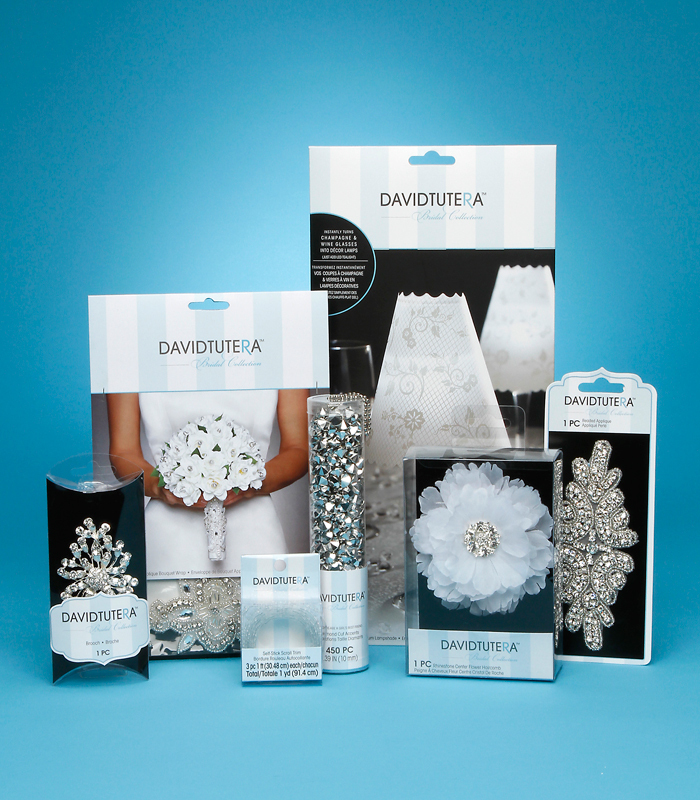 STEP 5: Add sparkle and elegance to your arrangement with more David Tutera Brooches and Crown picks. I just love a brooch bouquet…don’t you? Cut 2 pieces of 26 gauge floral wire (one for each side) and thread through brooch. Twist each piece of wire, then twist together. Stretch wrap wired brooch to floral pin and add to your arrangement. I wish I could show you how beautiful the brooches and crown picks look when they catch the light! They twinkle like tiny stars! A beautiful centerpiece must have an equally gorgeous container am I right? When I create flower arrangements I like to make my filler just as lovely as the flowers. Almost like wedding cake…it just wouldn’t be the same without the cream filling! For my vase filler I combined David Tutera Faceted Diamond Charms, Decor Pearls, Glass Gems and tumbled glass. Grab a large bowl and dump all of your filler into it. Mix it up well and add it to your vase! I love how the mix of decorative fillers play off of one another. This custom mix allows the centerpiece to sparkle and shine from top to bottom! Adding lights to your centerpiece really sets the mood for romance. Not only that but we want all the sparkling brooches, crown picks, crystals, and diamonds to catch that light and shine! STEP 1: Apply Mod Podge to LED Branch. STEP 2: Fill a bucket with decorative sand. Hold branch over bucket and use a scoop or shovel to apply sand. *I used David Tutera Candy scoops…by far the fanciest shovel I’ve ever owned! Once your branch is covered stick it right in the bucket to dry. *TIP* Look for sand in the floral section. You want the chunkier kind with a touch of sparkle…NOT the ultra fine craft sand. STEP 3 : When your branch is dry add batteries and place it in the vase. Be sure to keep the battery pack within reach and out of view. *TIP* Tape it on/off switch side up to the part of the branch that will be covered by the floral ring. Add dried branches around the LED branch to fill out and complete the look. STEP 4: Add a warm glow to the flower part of your arrangement by adding David Tutera LED lights. These lights are soft and subtle. Just thread through arrangement taking care to tuck any exposed wire behind your blooms. *TIP* These lights show better towards the top of the arrangement. It’s very subtle so don’t be shy about letting it shine on top. If you place it towards the back or bottom of your arrangement it will get lost. I’ll have more projects to share with you using the David Tutera Bridal collection real soon! In the meantime you can check out some of my recent projects for my friend’s wedding below using this truly versatile bridal collection. Want even more DIY wedding inspiration? Take a look at these other amazing projects using the David Tutera Bridal Collection…prepare to be inspired! Great Job! love the paper flowers but requires too much PATIENCE for me! I want to give it a try….how tall is the vase? thanks! Holy Guacamole girl! What a fantastically creative use of the products! Amy, this is amazing. It is actually so unbelievable that I am intimidated. Masterpiece. This is gorgeous! I’m loving that the flowers are purple! Purple was one of my wedding colors! So glamorous!!! And thanks for showing how to make the flower ring! This is STUNNING. You did a great job. The whole thing looks amazing. Anita Houston recently posted..February ATC’s Received! WOW!!! That is absolutely beyond gorgeous! WOWZER!!. heavenly stunning! !..And then the lights are on, I have no words!!. You’re brilliant, my friend. You rock this one, Tuttera must be proud :). I can’t get enough of the blings and the sparkles peeking from the vase & branches. AMAZING creation!!. OMG this centerpiece rocks! Your friend’s wedding will look amazing with all of the gorgeous flowers you’ve created for her! And then you add this centerpiece into the mix too? Amazing, girlfriend! I adore how you added sand to the lighted branches, and how those lights and the other David Tutera accessories blend together so well with your flowers. Wow!! Those paper flowers are beyond GORGEOUS! I can’t believe you made them…so so so beautiful!